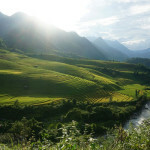 Travelling from Hanoi by Sapa Express via the new highway to Lao Cai. You know that the Topas Ecolodge and Nam Cang Riverside Lodge are located outside of Sapa town, in the tranquil mountains. Go beyond and visit the many colorful minority groups of Sapa, on a cultural tour with guided village walks and overnight stay in a Red Dao village and at Topas Ecolodge. Duration: 3 days and 2 nights. You can extend more nights. Kindly contact Sapa Travel in advance. Day 1: Take Sapa Express to Sapa. Get deeper into the mountains to Nam Cang Riverside Lodge. Day 2: Explore the remote Red Dao and Blue H’mong village. Transfer to the Lodge. 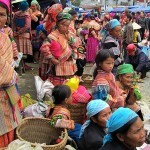 Day 3: Relax at Topas Ecolodge or visit Sapa town. Transfer by Sapa Express to Hanoi. From 6:30 – 7:00 AM, the Sapa Express will pick you up at your hotel before departing Hanoi for a 5 hours transfer to the town of Sapa. You will have lunch in a local restaurant in Sapa town on your own expense. From Sapa town you will take another 1.5 hour drive on a mountain road running along the picturesque Muong Hoa valley and enormous Hoang Lien Mountain Range to Nam Cang Village. Finally you will cross a private bridge and check into your private room in the comfortable Nam Cang Riverside Lodge. You can now explore the village or relax in the river or at the riverside veranda. Enjoy your dinner and you may want to stay late hearing interesting stories of life of the Red Dao minority, your hosts for tonight. The morning is for visiting the Red Dao minority village. 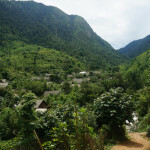 Nam Cang village locates in the most remote area of Sapa. The Red Dao women wear some of the most colorful and diverse costumes of all Vietnam’s ethnic groups. Herbal bath, local medicine and embroidery are some of the things that the Red Dao are very skilled at. Accompanied by your guide, you will explore around the village and learn how the local villagers make writing paper, jewelry and embroidery. In the afternoon you can choose to relax at lodge, make more visits to the village, take a swim in the river or join a trek to explore the beautiful surrounding nature. The 3 hours moderate trek starts with an ascent to a small Blue H’mong village, but from here it is mostly straight and downhill with a beautiful view to the high mountains, waterfalls and the deep valley. You then have a transfer to Topas Ecolodge. You will spend the night in your own private bungalow with a view of the valley and dotted mountain surroundings. The morning is at your leisure at the lodge. You can either relax or borrow free of charge mountain bikes from the lodge for an exploration to the neighboring villages. You can also take a scheduled shuttle bus to Sapa to visit the town. At 14:00, Sapa Express departs from Topas Ecolodge, pick you up if you are in Sapa town, and return you to your hotel in Hanoi. 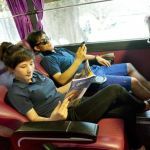 – Topas Mountain Express can only pick up and return passengers at hotels/ residence in Hanoi’s Old Quarter and Tay Ho District. If you would like to extend your stay at Nam Cang Riverside Lodge or Topas Ecolodge, please request this when booking.